Beth Behrs is an American film and television actress and writer. She is best known for her role in the CBS comedy series 2 Broke Girls in which she starred as Caroline Channing. Behrs was widely praised for the show which spanned six seasons and earned her nominations for the People’s Choice Awards as well as the Teen Choice Awards. She was born on the 26th of December 1985 to David and Maureen Behrs in Lancaster, Pennsylvania. Her family was made up of her father who was a college administrator, her mother who was a first-grade teacher mother and her sister. When Behrs was four, her family moved to Lynchburg where she started performing in theater. By the time Behrs was 16, her family had moved to Marin County, California where she was enrolled in Tamalpais High School. She was accepted into the school Tamalpais High’s highly respected drama program in 2001. After graduating from high school in 2004, she began studies at the American Conservatory Theater in San Francisco, where she classically trained as a singer and went on performing in plays. A few of those she performed in include A Bright Room Called Day and Korczak’s Children. She also performed in the musical Dangling Conversations: The Music of Simon and Garfunkel. Behrs was named Miss Marin County in 2006. Behrs soon moved to Los Angeles, California to commence acting studies at the UCLA School of Theater, Film, and Television in 2004. Among her theater performances while at UCLA was a production of Grease at the San Francisco’s Ray of Light Theatre in which she played Sandy Dumbrowski. She graduated with a bachelor’s degree in critical studies in 2008 and after graduating, she was awarded a Young Musician’s Foundation Vocal Scholarship. The young actress got her first movie role in 2009; it was a role in the film American Pie. She went on to star in an independent comedy, Adventures of Serial Buddies as Brittany which also starred Kathie Lee Gifford, Artie Lange, and Christopher Lloyd. Other roles she has played include the alien girl in Route 30 (2012), Deborah in Chasing Eagle Rock (2015) and Brooklyn in Hello, My Name Is Doris (2015). 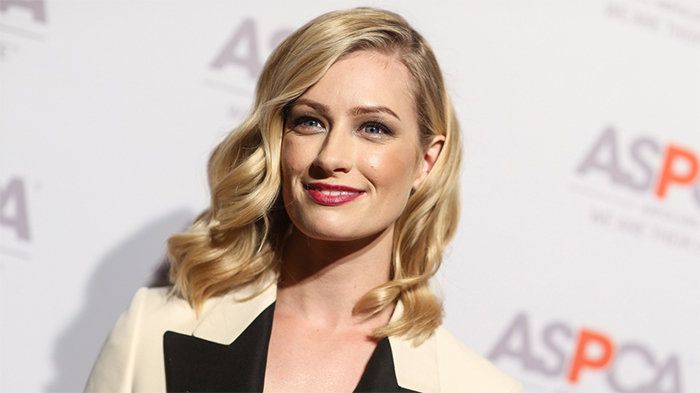 Beth Behrs entry into television began with guest appearances on shows like ABC’s Castle and NCIS: Los Angeles. In 2011, after several auditions, she landed the lead role in CBS sitcom 2 Broke Girls where she played Caroline Channing. Her other television roles and appearances include Regen in Pretty Tough (2011), Nell in an episode of The Big Bang Theory (2018), and Gemma Johnson in The Neighborhood (2018). For someone who has been around the industry for barely a decade, Behrs has not done badly for herself. Though her earning per movie is really not certain, she has an estimated Net Worth of $6 million. Behrs is married to actor Michael Gladis. Gladis was raised in Farmington, Connecticut. After graduating from Farmington High School, he attended SUNY School of Art Design at Alfred University and then transferred to the State University of New York where he earned a bachelor’s degree in theater. Gladis portrayed Paul Kinsey in the first three seasons of popular television series Mad Men. He has starred and appeared in a host of other television series including Law & Order, Third Watch, Hack, The Good Wife, Medium, House, Leverage and Justified. Among Gladis’ feature film roles are K-19: The Widowmaker (2002), Armed Response (2013), and Not Safe for Work (2014). He was also in the short film The Argument alongside Beth Behrs in 2012. Behrs got engaged to Gladis in 2016 after the two had dated for six years. She and Gladis got married at Moose Creek Ranch in Victor, Idaho in July 2018. 1. Behrs is also a writer. She has co-created Dent, a young adult webcomic with Matt Doyle since 2016. In May 2017, she released the book The Total Me-Tox: How to Ditch Your Diet, Move Your Body & Love Your Life. She lays out a journey to happiness and good health in the book. 2. Behrs is the founder of the SheHerdPower Foundation which uses equine-assisted therapy to aid women who have been victims of sexual assault by pairing them with horses. Equine therapy has helped her manage her own challenges with anxiety and panic attacks she had experienced since her teenage years. 3. Behrs was in the music video of the Lady Antebellum song Downtown in 2013. 4. Behrs’ height is 1.65 m (5 ft 5 in) and she weighs 117 pounds (53 kg). 5. As a young school girl, Behrs was passionate about soccer and was a part of her school team that traveled throughout the East Coast playing in tournaments with other youngsters. She had to quit football to concentrate on her acting.